Pisa, Italy is best known for its leaning tower, but there is so much more to see in this Tuscan town. Piazza dei Miracoli, the area around the cathedral and the tower, is beautiful, and a visit can easily occupy several hours. Pisa was one of the four great maritime republics in the Middle Ages, and it retains a good selection of monuments from that era. There's also the Arno River, a university, and several interesting museums. It's a good city for strolling and enjoying at a leisurely pace. Pisa is located in the northern half of Tuscany, not far from the coast and about an hour west of Florence. Pisa has a small airport, Aeroporto Gallei, with flights to other Italian airports as well as some European cities and Great Britain. Take Bus #3 to get from the airport into Pisa. Airport car rentals include Avis and Europcar. Take the A11 or A12 autostrada to get here by car. Pisa is easily reached by train or bus from Florence, Rome and the coast of Tuscany. Local buses serve nearby towns. Wandering Italy offers a video about how to get from the Pisa train station to Piazza dei Miracoli to see the leaning tower and cathedral. Pisa is home to several top-rated hotels, including the Helvetia Pisa Tower, Hotel Bologna, and the Royal Victoria Hotel. But if you want to experience the town like a local, consider staying in a holiday rental apartment like Behind the Tower in the historic center. 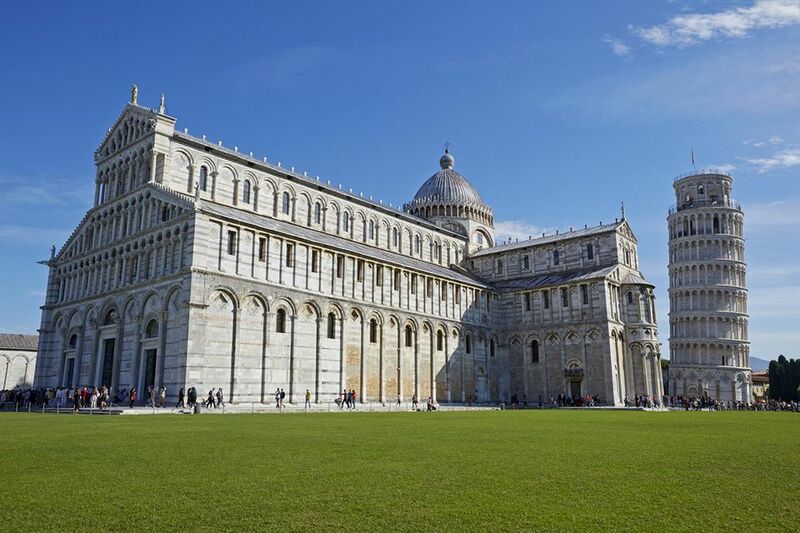 Our list of Pisa tourist attractions gives details about the town's top sights and tips for what to see during your stay. Caffe dell'Ussuro is a historic Pisan cafe that first opened in 1794. It's located in a 15th-century palazzo at Lungamo Pacinotti 27. One of my favorite restaurants is Ristorante Lo Schiaccianoci at Via Vespucci 104 near the train station. You'll find traditional food at Al Ristoro dei Vecchi Macelli, Via Volturno 49, and Antica Trattoria da Bruno, Via Bianchi 12, both recommended by the Touring Club of Italy. Tourist offices are located in Piazza Duomo and at Piazza Vittorio Emanuele II 16. There's also a branch at the airport. The city can be hot and crowded in the summer, especially in the area around the cathedral and tower. Many tourists come only for the day, so if you're visiting in high season, you might want to spend the night and enjoy the sites in the morning or evening. Spring and fall are the most pleasant times to visit Pisa. The Gioco del Ponte or "bridge game" is a re-enactment of a medieval contest between Pisans living north of the Arno River and those living south of the river. A parade with participants dressed in medieval costume begins the festival, then two teams of 20 people push a huge cart along the middle of the bridge, trying to reach the opposite team's area. Pisa hosts the annual Regatta of the Ancient Maritime Republics, a boat race between the maritime republics of Pisa, Venice, Genoa and Amalfi, every four years. The race is preceded by a parade with costumed participants representing the four republics.